Last Friday, five days after the terrorist bombings in Boston, Glenn Beck claimed that America should "demand impeachment" of President Obama for a government cover-up of a Saudi student's role in the attack. That was yet another example of Beck "jumping the shark." Over the weekend, we found the most likely source of Beck's misinformation, an Islamophobe named Walid Shoebat, and offered video from CNN that exposed him as a liar and a fraud. On Monday, Beck did not cite Shoebat, but claimed that he had a source high up in the administration. As of last night's show on the BlazeTV, Beck admitted to his employee, Buck Sexton, that all he has is "conjecture." Splash! Beck doesn't clear the shark. "Jumping the shark" is "an idiom created by Jon Hein that was used to describe the moment in the evolution of a television show when it begins a decline in quality that is beyond recovery, which is usually a particular scene, episode, or aspect of a show in which the writers use some type of "gimmick" in a desperate attempt to keep viewers' interest." Beck has made a living jumping the shark for years, but this time, even some of his own followers are disappointed in him. No, Mr. Beck; it sounds like slander and defamation of character. To his utter disgrace, Buck Sexton's reply was, "No, No; that's all plausible. I just can't say it's provable." 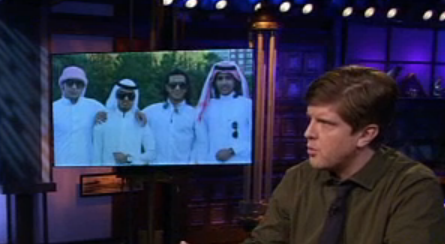 Sexton must be getting a decent pay check from Mr. Beck to not call Beck out for this sleazy attack on this Saudi student. "Govt/administration is covering up action/info"
"Please call your cable companies." Always the huckster, even when under water with a shark gnawing on his limbs. Beck's attack on Abdul Rahman Ali Alharbi is "totally conjecture," but that doesn't stop his most gullible and reactionary followers from hanging on his every word. Efforts to contact the Boston FBI and Alharbi himself for alternative versions of Beck's "conjecture" continue. Glenn Beck wins the Charles Darwin Prize? WTF?